As a fellow Unison member, I was deeply touched to meet and talk to some of the Birmingham homecare workers campaigning outside Labour Party conference last week. Their working hours are going to be cut by Birmingham Council, they told me, which would bring their take home pay below the poverty line. My mum, who passed away in 2012, was a homecare worker in Birmingham back in the early 1980s. She had been a cleaner in a children’s home before that, and I can remember how proudly she used to announce to people what she did for a living when she got her new job. The people she worked for became friends to my family. My mum would work longer hours than she was supposed to, and keep in touch with them outside of her working hours because she thought of the role as a vocation. We lived in the suburbs of South Birmingham, which meant in the early years of working as a homecare assistant Mum had to get two buses to the inner city to help her first two clients. Mr and Mrs Hackman lived in a high-rise council block. Mrs Hackman had a learning disability and was a wheelchair user, which restricted her mobility to the extent that she was unable to leave her flat. The couple had no other assistance apart from my mum. I remember her telling me how Mr Hackman struggled looking after his wife and cried a lot in despair and how she did what she could to help them both. Miss Ilsley was a lovely elderly lady who lived alone in sheltered housing. Miss Ilsley never married or had children, so my mum was the only contact she had outside of her neighbours. Mum’s visit was the highlight of her week, and I can remember how happy she was to see us when we visited her at Christmastime. My mum would always do a lot more for Miss Ilsley than she was employed to do and they would keep in touch by phone when Miss Ilsley was feeling lonely. My mum was in contact with them many years after being allocated other clients. She found the work hard and challenging at times, especially as her arthritis got worse, but always did it with a willing smile until ill health forced her to give up the job she loved. Mum was proud to work for Birmingham City Council, but the pay she received wasn’t enough to support her family without the additional income of my dad who was employed by a local factory. Homecare workers like my mum aren’t as visible as others from the care sector such as nurses, and yet the work that they do is vital to communities across the country. Like all care workers, they often do above and beyond what is in their job description and put their heart and soul into what they do, becoming friends to those they support. In return, they receive low wages and work in isolation. That is where trade union membership is vital: to collectivise their struggle for representation; to help them receive a fair pay settlement for the work that that they undertake. I’m now a councillor in the Royal Borough of Greenwich and I know first-hand the pernicious austerity this Tory government has imposed on local authority budgets. It is not the fault of councils that they are being forced to make cuts to the services we all benefit from. 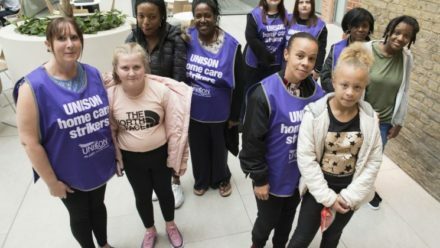 I hope for Birmingham homecare workers like my mum that, in collaboration with Unison, Birmingham City Council can find a way to treat the Birmingham care workers with the dignity and respect that they truly deserve. Ian Hawking is a Royal Borough of Greenwich councillor.